“One of the very first times we installed this system was in 1983, if I remember rightly. It was at an Italian grinding workshop, where it was used to measure through-fed pins with a repeatability of 0.5 microns at 3600 pieces/hour. At the time, the idea of using lasers in a workshop was seen as pure madness or science fiction! Today, in centreless grinding and measuring processes, greater efficiency and precision are required, as well as automatic process adjustment and non-complying part rejection. In these processes contact-free Laser or CCD optical measuring systems are used that allow moving parts to be measured with great flexibility. In other cases, generally in through-feed grinding, pneumatic measuring systems are used. Marposs systems use laser measuring technology, developed since the 1980s by AEROEL. Taken over by Marposs in 2017, AEROEL has continuously improved its technology and extended its range of applications, thanks to its remarkable and unbeatable know-how that today ensures its position as an undisputed market leader. The measuring tool - the sensor - is the heart of the system, whose successful operation is guaranteed by both specific application software that takes into account the shapes of the workpieces and their speed, and the customer-supplied devices that complete it, such as transport and cleaning systems or reject and selection devices. This technology, that is useful in all cases where the diameter of a product or workpiece needs to be measured quickly and accurately, becomes indispensable when the workpiece cannot be touched and stopped, as in the case of: drawn metal wires, electrical cables and conductors, extruded plastic pipes, hot-rolled products, glass tubes and centreless grinded product parts. It is particularly effective and competitive in simpler bench and off-line measurements too. AEROEL gauges use a Laser Diode that generates a thin beam of light that is collimated on the object to be measured. The laser beam is deflected at a constant speed by a rotating mirror positioned at the focus point of a lens in order to explore the measuring zone at high speed. During this movement the beam intercepts the object to be measured and casts its shadow onto the receiver. The duration of the shadow is proportional to the size of the piece to be measured, while the duration of the light is related to the position of the object in the measurement field. Inside the receiver a lens receives the light and concentrates it onto a photo diode. The signal from the diode is then processed by a microprocessor that converts the shadow/light times into diameter and position values. provides the functions required for each specific application. 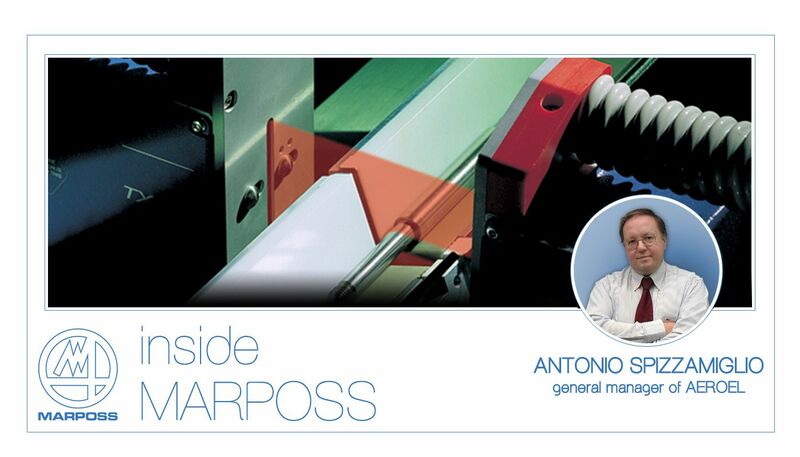 Marposs has perfected two systems for checking the diameter of mechanical parts. In both cases, the technology used guarantees superior measuring, speed and precision flexibility. Installing the systems and instructing personnel takes one or two days at most. In fact, operating the system requires no specific technical training and, above all, the system does not need to be monitored by an operator. The Grindline.X Laser System allows any through-feed diameter whatsoever to be measured immediately, without stopping the piece, without zeroing the tool on the master and without any “presetting”. The tool adapts to pieces and diameters simply by recalling the required programme saved in the product library. The system can measure moving, hot, deformable or vibrating products. Permanent auto-calibration automatically and completely compensates for the effect that changes in the ambient temperature may have on both the measuring tool and the piece to be measured. The measuring process which adds less than 1 millisecond to the cycle time is extremely accurate and precise. In fractions of a second, measurement repeatability of tenths of a micron and even hundredths of a micron can be reached on thin wires. The system’s accuracy is only limited by the uncertainty of the masters used for factory settings, normally +/-0.25 micron. Discover zero defect production with the Grindline Laser System!